Thanksgiving Day is almost here! Whether you have the honor of hosting a Thanksgiving dinner at home, or you'll just be bringing a dish to a potluck party, thinking of the perfect food to prepare for your family and friends can be difficult. If you're still looking for recipe ideas for your Thanksgiving feast, you should check out Macy's Recipe Share on Facebook. 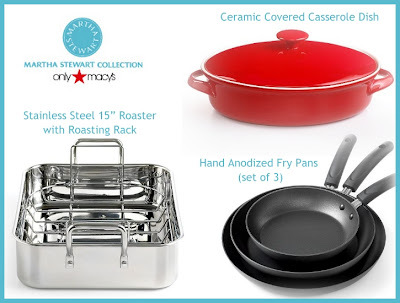 There you'll find favorite Holiday recipes for appetizer, side dish, main course and dessert shared by Macy's fans. And while you're there, and you have your own favorite recipe to share, you might as well do so for a chance to win awesome prizes like $1000 Macy's gift card and a signed copy of Marcus Samuelsson's "New American Table" cookbook. Today, I'm sharing with you another family favorite! Just as I've mentioned before, we all love mushrooms here. But it's not only mushrooms that made this dish our favorite. This has chicken wings too which we love a lot! With mushrooms and chicken wings combined, you can just imagine how happy we all are whenever we have this on our dinner table! 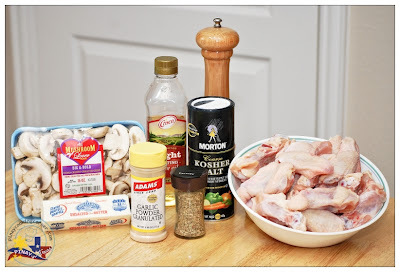 This very easy to prepare but totally great tasting Garlic Chicken Wings and Button Mushrooms can be served either as an appetizer or part of the main course. 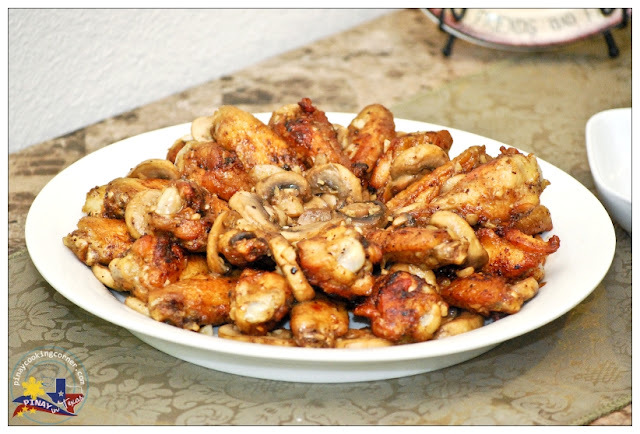 You can never go wrong with chicken wings and mushrooms, right? 1. 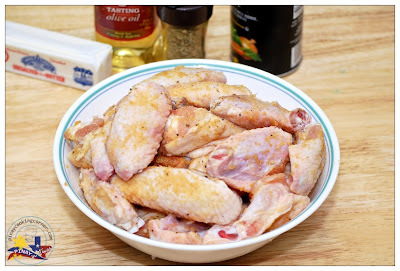 Season the chicken wings with garlic powder, salt and black pepper. Let sit in the refrigerator for at least 30 minutes. 2. 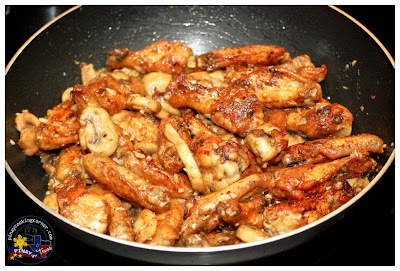 In a large skillet over medium heat, fry chicken wings in olive oil until golden brown. (You can do this in the deep fryer if you want.) Remove from heat and set aside. 3. In the same skillet, melt butter. Add minced garlic and saute until light brown. Add button mushrooms. Saute until cooked, about 5 minutes. 4. Remove from heat. Add cooked wings and toss until well mixed. 5. Transfer to a serving platter and sprinkle with parsley flakes. Just saw your post on foodbuzzed...buzzed you! Your chicken wings look so tempting, incredible, and delicious. Love the addition of the mushrooms. Yumm! 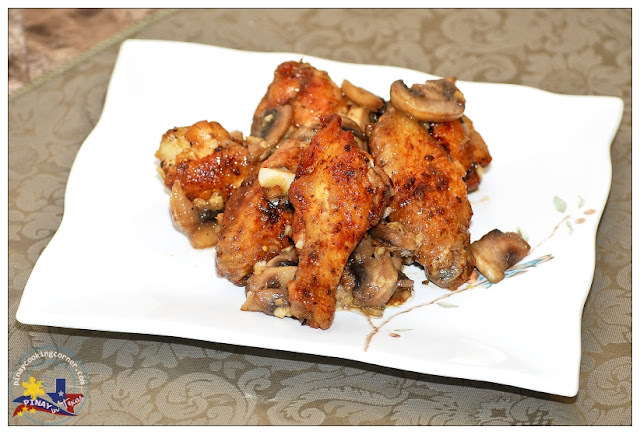 Love the addition of the mushrooms on top of these garlic wings! 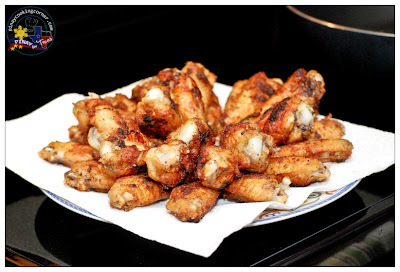 I have tried several wing recipes, some good and some not so good. 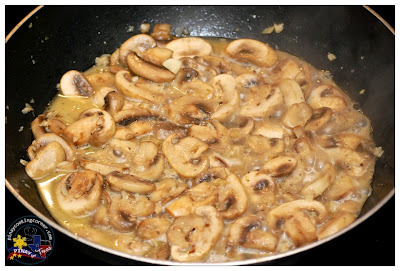 Your recipe does look tasty and with the mushrooms you have added something healthy as well as another layer of flavor. Great post. Wow, i love the idea of garlic chicken. Sounds so delicious and down right amazing! Very simple and easy to prepare and importantly looks DELICIOUS! 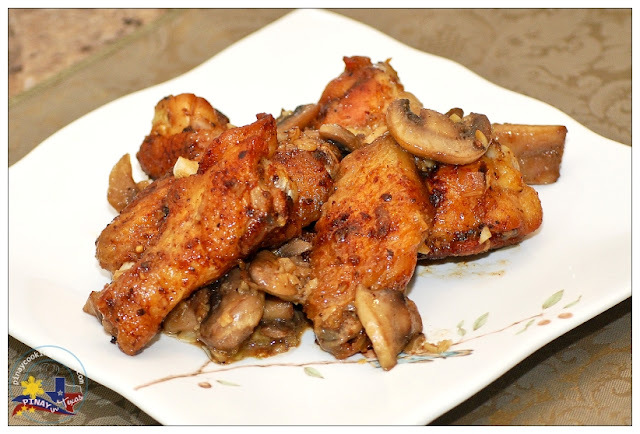 We love chicken wings and this sounds like a perfect weekday dinner! You can never go wrong with chicken wings ;) & that looks delicious ! With all that garlic, you know I'd love these wings! And the mushrooms is a perfect match! Marvelous recipe! Your chicken wings look delicious Tina. I am drooling over here. Oooh that garlic mushroom sauce looks amazing! I want some with some hot rice to soak up all that goodness. YUM! I simply love the wings though I need to cut down due to my high cholesterol level, you know my weakness of eating the wings, feet, skin and all that fatty part of the chicken. I AM DROOLING! Just love wings and when you say garlic wings .. i can't help but drool! I LOVE LOVE THIS COMBINATION Tina! You did fantastic job!!!! Those wings look mouthwatering!!! Such simple and yummy recipe! I love the mushroom chicken combination.